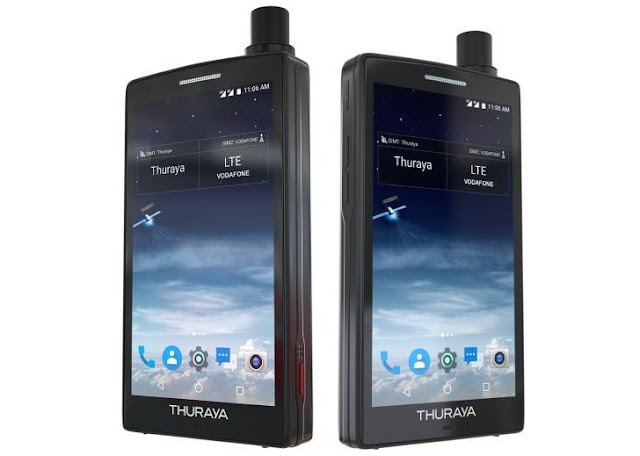 Thuraya has launched the world's first Android Satellite smartphone, the X5-Touch. This smartphone runs like the everyday Android device, and its built was made to withstand extreme weather conditions. "A pioneer of many firsts in the satellite industry, we are proud to finally announce the commercial availability of Thuraya's new X5-Touch Android satellite phone," Thuraya's CCO Shawkat Ahmed said. "The X5-Touch reaffirms our commitment to offer our partners and end-users the best products available, and best value no matter where they are." The Thuraya X5-Touch has a 5.2-inch 1080 IPS touchscreen display and runs on a Snapdragon 625 chipset. The phone is powered by just 2GB of RAM, 16GB of internal storage which can be expanded up to 32GB via microSD card. At the rear of the device, there is an 8MP camera, and a 2MP selfie snapper in the front. Theres a 3,800mAH battery juice, and yes, the device runs on Android 7.1 Nougat. It weighs 262 g.
The device comes with IP67 water and dust resistance, and as well as MIL-STD-810 certification to be able to stand extreme conditions. The Thuraya X5-Touch has a retractable antenna for its satellite functionality. The device has an always-on dual SIM functionality with one SIM working on 2G/3G/4G networks while the other deals with the satellite. Other functionality and features include sensors such as NFC, Gyroscope, Compass, Barometer, Approximation, Illumination and Accelerometer. The device supports navigation via GPS BeiDou and GLONASS. There is an SOS button which when clicked upon, triggers the smartphone to place a call or SMS to pre-set numbers. While this is seen as the first Android Satellite smartphone, the U.E.A based Mobile Satellite Service Provider should have spiced up the specs a little. The absence of a finger print sensor still brings the annoyance of users having to type in passwords, codes or draw patterns everytime they want to access the phone..
Another thing is the Android version. The device should have come with at least Android 8.0 or 9.0 Pie instead of the Android 7.1 Nougat. The small RAM size, low storage capacity, low camera etc. are stuffs that makes the phone unattractive. But hey, its a Satellite phone and not a premium or gaming device. Thuraya says the X5-Touch will be sold for £999 and will be out in December 2018, and available in certain countries by the end of January 2019. The device will also be available in about 160 regions the Mobile Satellite Service Provider operates in.